Los Gatos Masters (LGM) is a registered United States Masters Swimming (USMS) program and each member must be registered through the USMS in order to participate. Please show your USMS registration card to the coach at your first workout. LG Masters is paid directly through Los Gatos Recreation or at the pool to the coach. ***Masters fees are separate from the Kain Performance membership, except Saturday. *The Masters punch card is for Masters swim program only and is not affiliated with the Kain Performance Team punch card. 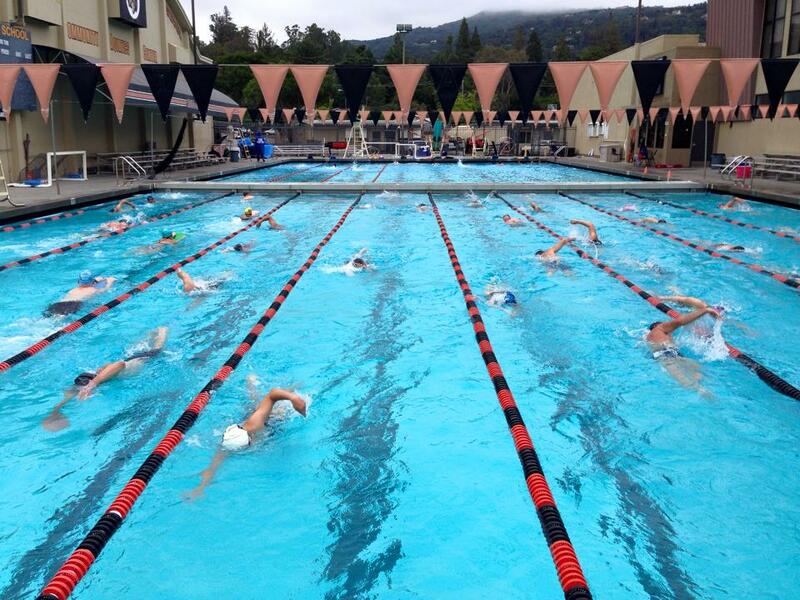 Los Gatos Masters welcomes swimmers of all abilities, age 19 or over, who are interested in regular structured workouts. Previous competitive swimming experience is not necessary. Triathletes are welcome and encouraged to join! I joined Kain Performance in 2003 and since then this team and triathlon have become a huge part of my life. Pete and Shari have created a great program lead not only by their coaching but their team concept. We train as a team, we push each other to improve, and on race day we support each other like no other group out there. In the past 7 years we’ve traveled as a team to races in Europe, Hawaii, and of course all over the US. I’ve made great friends along the way and have improved at the sport more then I ever expected. I’ve gone from a middle of the pack finisher to actually winning my age group in a triathlon this past year. 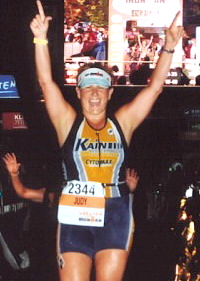 I’ve competed in National Championship races and have finished 50 triathlons including 3 Ironman’s. In 2009 I was part of the Kain Iron team that went to Ironman Austria. The trip and event was a perfect example of a Kain destination race. The 20+ athletes competing combined with their supporters made for a great group of people and an incredible experience on race day that I will always remember. At Kain it’s all about the team and weather you are an age group winner or a triathlon newbie you’ll fit in. If you’ve got a triathlon goal Kain Performance will help you achieve it. 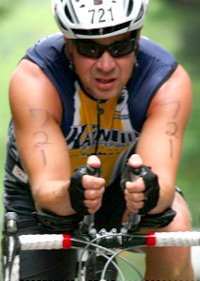 I ran into Pete at my gym in early 2010 and told him about my desire to start competing in the world of triathlons. Of course, I couldn’t swim more than a couple laps in the pool and hadn’t ridden a road bike since I delivered newspapers on a Schwinn Varsity back in the 70′s. Pete got me a great deal using the Kain Performance team discount on a new Specialized bike and all the accessories to go along with it. I began swimming, doing the Tuesday night team brick workouts, and Saturday team rides. Within two months, I completed my first sprint tri. Because I felt so prepared, it was a very positive experience. I had gained a lot of knowledge and insight from Pete, the coaches, and the other people on the team…everything from strategy, to transitions to preparation. I was hooked! Now, eight months later, I’ve completed six triathlons, including two Half-Iron events. 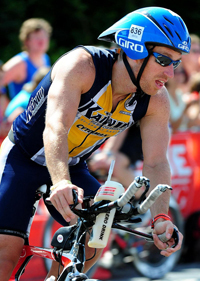 I can’t wait to take on Ironman Austria in 2011, with the 30+ people going from Kain Performance. I enjoy the energetic and supportive nature of the folks that comprise Kain Performance. Pete and Shari have a unique way of making training fun and enjoyable and they’ve created a team environment like no other. I couldn’t have picked a better group of people to train with! After several seasons with Team in Training, I joined Kain Performance to step up my training. I have really noticed an improvement in my running. Pete and Shari are a great team, and you never know what to expect in terms of the workout. Pete can take a hard workout and make it one of the best workouts ever. The other team members provide a lot of energy and team spirit, and make me not want to miss a workout. I was bitten by the triathlon bug after a season with TNT. Since joining Kain Performance this summer, my swimming has really improved through practicing the assigned drills, listening to the technique stuff and having one-on-one sessions coached by Becky Gibbs Lavelle. The running economy workouts have helped me make significant improvements in speed, with new personal records for 400m, 800m and 1 mile. I really enjoy Pete and Shari’s coaching style and applicability.